After you've completed the beadwork portion of your design on a traditional beading loom, you need to devote some time to weaving all of those pesky warp thread tails into your beadwork to hide them. Please click on any image in this tutorial for a full-size view. After creating your beadwork on your loom, loosen all four wing nuts on its frame. Review the parts of a beading loom. Turn each warp bar toward the middle of the loom until the warp threads on both ends are completely unwound. If you used the winding method to warp your loom, use the tips of beading scissors to gently pry the looped thread off of the warp anchor on the front end of the loom (as shown in the photo on the left). 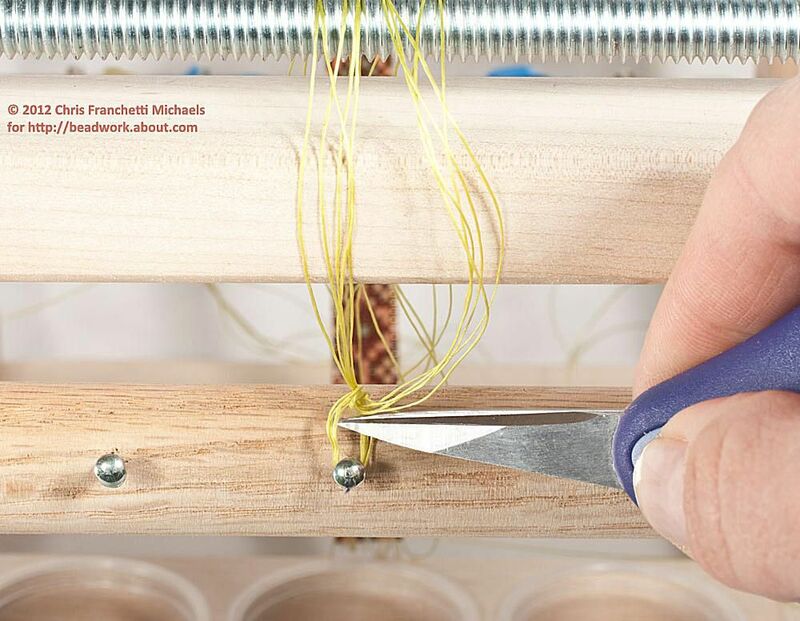 If you used the no-wind method to warp your loom, you'll need to use your beading scissors or hobby knife (such as an Xacto) to cut the thread free. Turn the loom around. If you used the winding method to warp your loom, remove the pieces of masking tape you used to hold down the threads. Unwrap both bundles of threads from around the warp anchor. If you used the no-wind method to warp your loom, simply lift the threads off of the warp anchor. Tip: Remember that you should only use beading scissors to trim the warps if they are nylon beading thread or cord (such as Nylon or C-Lon). If you used FireLine or PowerPro, use children's crafts scissors, a hobby knife, or other scissors designed for use with polyethylene threads. Tip: As you pass the needle through beads, try to keep it as close to the upper inside edges of the beads as possible to avoid splitting the existing thread. Keep in mind that on one edge of your beadwork, two thread tails will emerge instead of one. One of these is the tail of the weft thread (rather than a warp). You can wait to weave-in the weft tail until you've dealt with all of the warp threads. Note: Although the beadwork is shown lying flat in the photos, you should actually do the weaving-in with the beadwork held in your fingers. Switch direction and pass through the next two adjacent beads in the third row down, bringing the needle out at the edge. Pull the thread gently taut again. Continue this process, stitching through two beads in one direction and then two beads in the other, until your thread exits the first two beads in the tenth row. Pull the thread taut and cut it close to the beadwork. In the example, I'm using a thread burner, which makes a great cut, shrinks back the end of the thread, and can be used with both nylon and polyethylene beading threads. Keep weaving-in warps, but skip the center warp (if your beadwork has an even number of vertical columns) or skip one of the two warps that is adjacent to the center bead in the end row (if your beadwork has an odd number of columns). You can come back later and use that thread to make a loop for your clasp. When you reach the second-to-last warp thread tail, you'll start to run out of columns. To begin weaving-in that thread (shown on the left), pass through the two adjacent beads in the end row, and then weave-in as usual. Weave-in the last warp thread on this end the same way you wove-in the first warp thread, but cut the thread after it exits the ninth (rather than the tenth) row. This keeps the ends of the thread facing inward, which makes it easier to hide. Thread the needle onto the weft tail. To weave it in, pass through two or three beads in the last row, then weave back and forth through the beadwork for three or four rows. This should be enough to secure this thread, because by now the beads are filled with quite a bit of thread. Cut the thread close to the beadwork, as usual. Thread the needle onto the middle warp thread that you skipped. Pick up enough beads to make a small loop. I picked up ten beads. Optionally, make the first bead a different color than the rest of the beads. While holding the first bead between your fingers, pass the needle back down through that bead to create the loop. Pull the thread taut. The path that you take to reenter the beadwork with your needle depends on whether your beadwork has an odd or even number of vertical columns. If it has an odd number, like the bracelet in the example, skip over one bead in the last row of beads, and then pass back through that bead. If it has an even number of columns, pass straight down into the same space your needle originally exited (shown on the left), and then pass sideways through an adjacent bead in the second from last row (shown in the graphic beside the next step). Switch direction and weave back up into and through the entire end loop one more time. Click on the graphic on the left for a full-size view of the suggested thread paths for reentering the loop with odd and even column beadwork. Weave in this thread, using the same style of thread path you used to weave-in the other warp threads. Cut the thread close to the beadwork. Use the same techniques to weave-in the warp threads on the other end of the beadwork, and make a matching end loop there. Use chain nose or flat nose pliers to attach a ready-made clasp to your end loops with jump rings. I used a Vintaj antiqued brass lobster clasp and jump rings.